There are no words to describe the fabulous flavor of this traditional Polish holiday bread we call Makowiec. The filling is a distinctive combination of ground poppy seeds, orange and lemon peel, and ground toasted almonds. I love this bread! I grew up with it! It’s perfect for afternoon tea or as a light dessert. My recipe is pretty easy to make but you will need to grind the poppy seeds and I found an easy way to do that. I bought a spice & nut grinder (Cuisinart) and it grinds the poppy seeds and the almonds. Until I discovered the grinder, the only way to grind the seeds was to use an old fashioned meat grinder that you clamp to the counter and crank with your hand. I tried a food processor and a blender but neither one did the job. But it’s really easy with the spice grinder. 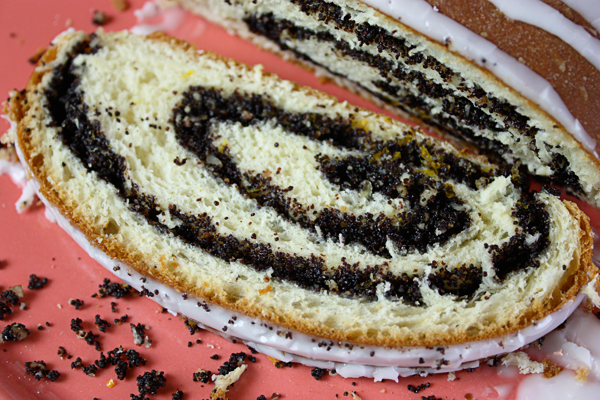 10 Comments on "Polish Poppy Seed Roll"
My poppyseed babka always splits. I follow the recipe but I use solo poppyseed filling. What am I doing wrong? Mine does sometimes too so it’s not unusual. It could be from rolling the dough too thin or not sealing it well enough. It’s also possible that canned filling may have more moisture than one you make from scratch. Thanks for this recipe and especially the lesson on kneading. On my mom’s Slovak side of the family as a little boy I remember this was a staple at my grandma’s house– she baked about 3 loaves a week and pulled them out for coffee or company. Lastly– I like the Polish version with the icing– it makes it more special. Thanks again for sharing this. Would an electric coffee bean grinder work? I’ve used mine to grind flax seeds. I have never used one but please report back if it works. I just discovered you again and I’m glad I did . I’m not polish descent however I remember eating this as a kid back in Mercersburg,Pa . ,(Love saying this name). It was delicious then and I will make the effort to use your recipe to make this . Kudos to Jenny- Necessity is the mother of invention ! you keep doing it I’m impressed and happy for you . Thanks for sharing your success ! Wow! That looks incredible Jenny!!! Me and Mike have a vacation day today and I am baking your christmas cookies!! Hopefully they will last till Christmas!!!! 🙂 I am making two batches and freezing them. I also made peanut butter blossoms and kiffles… I call it my “Jenny day”, cause I spent most of it in the kitchen! 😉 haha?? I love Makivnyk (Ukrainian poppy seed roll) and it was my job to grind the poppy seeds in an old fashioned coffee grinder. You put the seeds in the top hopper, turn the crank on the top and the grounds dropped into a drawer at the bottom. I still have it use it for Kutia too.